In the federal budget, Treasurer Scott Morrison promised tax cuts to all working Australians in the form of an offset and changes to tax income thresholds. But our analysis of Treasury data shows that while the government advertised these as payments to low and middle income Australians, most of the benefits would flow through to high income earners in future years. If all of the stages of the tax plan passed parliament, there would be a sharp increase in benefits for people earning above A$180,000, due to the reduction of their marginal tax rate from 45% to 32.5%. Taxes in most countries are progressive. This means that the more you earn, the higher your marginal rate (the additional amount you pay for each dollar earned). There are good reasons for this – progressive tax systems mean those on a lower income pay a lower average tax rate, while those on higher incomes pay a higher average tax rate. This reduces income inequality – as you earn more, for each dollar you earn, you will pay more in tax than someone on a lower income. With the 2018-19 budget, the proposal is for a “simpler” tax system from 2024-25. This means a reduced number of tax brackets, and a lower rate of 32.5% to those earning between A$87,001 and A$200,000. Well, you’ve still got a progressive tax system. That hasn’t changed. In fact, the percentage of people at the end of this plan, who are on the top marginal tax rate is actually slightly higher than what it is today. However this new tax system from 2024-25 is less progressive than the current system. It means higher income inequality – the rich get more of the tax cuts than the poor. As part of the new proposal, low and middle income earners get a tax offset in 2018-19, with high income earners getting very little. This part of the plan is progressive – more money goes to lower income earners. However, by 2024-25, the tax cuts means high income earners gain A$7,225 per year, while those earning A$50,000 to A$90,000 gain A$540 per year, and those earning A$30,000 gain A$200 per year. Of course, another factor of tax cuts is that they only benefit those who are employed. Tax cuts don’t benefit people like the unemployed, pensioners, students (usually young people) and those on disability support pensions. The conversation Australians need to have is how we should be spending the revenue boost we are seeing over the next few years. We can either spend this windfall gain on benefits to high income earners, in the hope that this will flow through spending to everyone else; or maybe we should encourage young people into housing through an increase to the first home owners grant, or increased funding for our schools, universities and health system. We’ve developed a budget calculator so you can see how your family is affected by the 2018 budget. A decline in incomes for the top 20% has caused inequality to fall slightly. 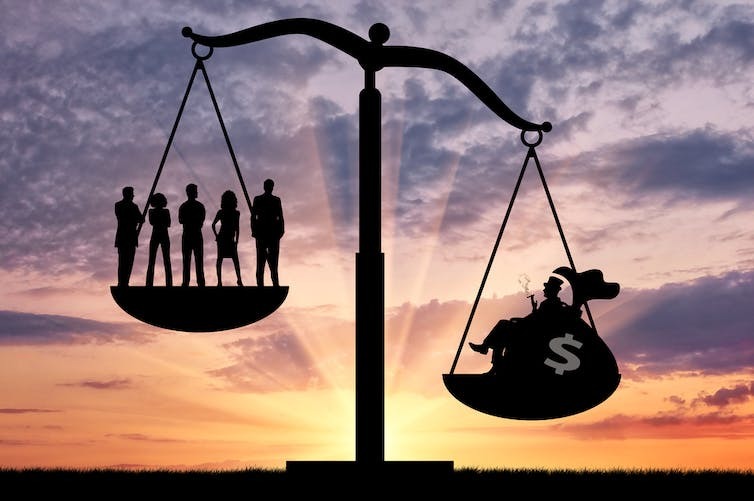 Income inequality has dropped slightly in Australia, largely driven by a fall in incomes for the richest 20% of the population, according to the latest Australian Bureau of Statistics (ABS) Survey of Household Income and Wealth. The richest 20% of the population have seen their real disposable incomes (adjusted for the number of people living in the household) fall by nearly 5%, or close to A$100 per week. Most other households have seen no real increase in their incomes over the two years since the previous survey was released. Our recent public debate over whether inequality is rising or falling ran into the problem that the two most important sources of data were showing different trends. The ABS survey continues to show a higher level of income inequality than the HILDA survey, but the latest trends now look more similar. Possibly the best characterisation of the latest ABS figures is that they show inequality remains higher than at any period before 2007-08, but in the short term it is unclear what to expect. As you can see in the following chart, there has been a slight fall in income inequality between 2013-14 and 2015-16, with the Gini coefficient for “Equivalised Disposable Household Income” falling from 0.333 to 0.323. The Gini coefficient is a measure between zero (where all households have the same income) and one (where only one household claims all the income). Equivalised Disposable Household Income is the total income of the household from all sources including social security payments, minus direct taxes, and then adjusted for the number of people living in the household. For example, a household of a couple with two children under the age of 15 is assumed to need 2.1 times the income of a household of a single adult to achieve the same standard of living. So what explains these most recent trends? At this stage, it’s difficult to be definitive. It should also be borne in mind that it has only been two years since the last survey, the overall change is not large, and so we should be cautious in unpacking the trends. But it is worth noting that this small reduction in income inequality has come at the same time as a small fall in both median and mean disposable incomes for Australian households. The average taxes paid by households have also risen slightly in real terms (adjusted for inflation) since 2013-14, while the average social security benefits have stayed the same in real terms. This masks a significant drop in the real level of family payments (such as the family tax benefit) received by households, and increases in age pensions and “other payments” (overseas pensions and benefits, partner allowance, sickness allowance, special benefit, war widow pension (DVA), widow allowance, and wife pensions etc.). However, where there does appear to be large changes are in the sources of income for households. If we compare incomes between the 2013-14 and 2015-16 surveys, we find that the only group that has enjoyed real increases in incomes are those whose main source of income is social security benefits. But these have risen by only A$6 per week, or about 1.3%, and they remain by far the lowest income households in Australia, with their average incomes remaining less than half of all other household groups. Households who mainly rely on wages and salaries have seen their average real disposable incomes fall by about A$17 per week, or about 1.4%. The biggest declines are among those who mainly rely on self-employment income from unincorporated businesses – usually a small business which has not incorporated as a registered company – and people whose main source of income is “other”. “Other” includes many things, such as income received as a result of ownership of financial assets (interest, dividends), and of non-financial assets (rent, royalties), as well as from sources such as incorporated business income (i.e. companies), superannuation, child support, workers’ compensation and scholarships. This group is fairly small – about 8% of households, but they are both the group with the highest and most unequal incomes and by far the highest level of net worth (assets minus liabilities). Their average incomes have fallen by around A$93 a week in real terms, or around 8%, but their median real incomes rose by around A$11 per week, suggesting that the loss in income was concentrated among higher income households in this group. This group in 2013-14 had by far the highest level of income inequality with a Gini coefficient of 0.474. This has fallen to 0.423 in 2015-16. But because a lot of this income comes from the stockmarket, we can expect it to be more volatile. The group who appear to have lost by far the most, however, are households whose main source of income is unincorporated business income. This is an even smaller group – around 4.6% of all households in 2015-16. Their real average incomes have fallen by more than A$160 per week, or around 16%. They also have a high level of inequality within their group, with a Gini coefficient of 0.353 in 2015-16, down from 0.389 two years previously. But the overall change in income inequality is not large, and it does not significantly change Australia’s international ranking. Writing in the Australian yesterday, Nick Cater of the Menzies Research Centre asserted that Australia is “one of the most equal and socially mobile nations on earth”. But even with the slight reduction in inequality, we are slightly above the OECD average, and there are around 20 OECD countries who are likely to have lower levels of income inequality than Australia. Overall, the data shows a relatively small change in incomes for employee households and for households whose main source of income is social security payments. Together, these account for 87% of all households in Australia. The reduction in overall income inequality in this period is therefore explained by the falls in income for the self-employed and for the “other” group – the group with the highest incomes and wealth. Understanding what exactly has been happening for these groups and why will require further time and analysis. The volatility of the income sources for these groups is another reason to be cautious about projecting future trends. The link below is to an article that looks at the woes of Nathan Tinkler, Australia’s poorest richest man.